Strathmore’s outdoor summer concerts are back with a new name, Live from the Lawn. 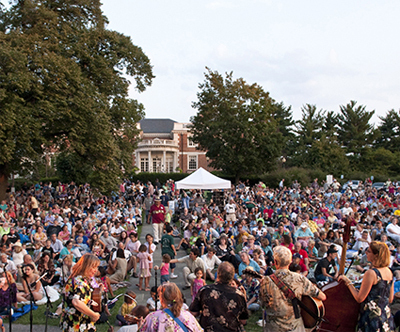 The free concerts take place on Wednesday evenings now through Sept. 9 at 5301 Tuckerman Lane in North Bethesda. All concerts begin at 7 p.m. Guests are encouraged to bring blankets or low beach chairs. The concerts are moved indoors for inclement weather. Virginia native Karen Jonas delivers country music with strong storytelling that combines the fiddle, guitar, lapsteel, and organ. Jonas’ newest album, Country Songs, was released in October of last year. Lauren Calve, a singer-songwriter, preforms prior to Jonas at 6:30 p.m. In case of inclement weather, concerts are moved indoors. Check Strathmore website or Twitter or Facebook sites for up-to-the-minute information. Parking is available in the Metro garage for $5.20 with Metro SmarTrip card or major credit card. Enter the parking garage off Tuckerman Lane. Parking for patrons with disabilities (with tag) and Strathmore Stars Parking (with Strathmore Summer Parking Pass) is in the Mansion lot on a space available basis. Enter at 10701 Rockville Pike until 7 p.m.
Ridgewells Tempo Grill is open during the performances. View the menu, here. LOOK HOMEWARD – Look Homeward hails from North Carolina and draws influences from the bayou to the Appalachians while entertaining with lively bluegrass, foot-stomping folk music, and a whole lot of Southern charm. This talented quartet mixes old and new, banjos and trombones, and pure musical sensibilities to make you feel right at home. BIG RAY & THE KOOL KATS – Trumpeter Ray Caddell leads this band of musicians, with bing band to dance hits to pop and R&B favorites. Big Ray and the Kool Kats can turn a hot summer night into an unforgettable event with a 4-piece rhythm section, 4 sizzling horn players, and multiple vocalists. FÉMINA – World music trio Fémina have established a unique style within musical genres from around the world. Their diverse songbook and colorful theatrical performances have taken them on tours throughout Europe, Mexico, and the US, bringing their Latin roots to audiences worldwide. Fémina sparks life into their brand of global music and listeners leave captivated by their spirited sounds. MATUTO – This four piece group combines the ccordion, guitars, bass, drums, and triangle to create a unique sound. Matuto moves seamlessly between multiple genres of music producing bubbling Brazilian backbeats, Appalachian melodies, and bluesy riffs. Matuto’s music is a movement that explores humanity and borders through the intermingling of their musical styling. LINDSAY LOU & THE FLATBELLYS – Americana roots take center stage for Lindsay Lou & the Flatbellys, a string band originally from Michigan with a home base in Nashville, Tennessee. Melding together soul, folk, and bluegrass, Lindsay Lou & the Flatbellys serve the heart and soul through warm harmonies and lead singer Lindsay Lou’s demandingly smoky vocals. The 4-piece string band has taken virtuosic musicianship and dynamic bluegrass from music festivals around the world to the intimate setting of the dining room where their latest album, Ionia, was recorded. The ability to move through musical genres in stunning live performances leaves audiences swooning. UKE FEST – It’s back, and better than ever! The summertime strum celebrates its ninth year, with Benny Chong, Craig Chee, Sarah Maisel, Sam Marchuk, Maureen Andary, Cathy Fink and Marcy Marxer. Don’t miss this all-star celebration of the little instrument that brings people together in harmony. AKUA ALLRICH – Soul singer and D.C. native Akua Allrich blends jazz, African rhythms, and her ever-evolving artistry to distinguish herself as one of the area’s most vibrant singers. Allrich often sings in languages such as Portuguese, French, English, Spanish, and more. Her latest release, Soul Singer, has Allrich approaching timeless jazz standards with her blues and pan-African influences. TEAM FAMILIAR – Get ready for the funkiest party of the summer! Formed by DC native and Go-Go legend Donnell Floyd, this soulful group rules the roost, performing with top recording artists and reigning supreme on the sultry Go-Go scene.